Graduation season is always one with mixed emotions, as a new group of graduates are sent out into the world. Burbank and Burroughs Highs will both miss a number of graduates who will be tough to replace as leaders in sports. The following summarizes where student athletes from the two schools will continue their education and athletic careers. With two teams that reached CIF Championship contests, the Bulldogs will certainly have some representation at the college level. Burbank’s football team has at least six that will continue their careers, all in separate directions. Receiver Joey Miller is headed to the University of California, Davis. Linebacker Jake Kelley is headed to the University of La Verne. Quarterback Guy Gibbs will move on to Glendale Community College. 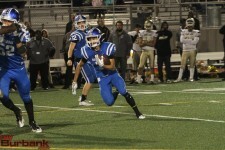 Receiver Forrest Fajardo will play at Pasadena City College. Offensive lineman Scott Breslin will continue at Ventura College and defensive end Matthew Villagran will play at Los Angeles Valley College. From the basketball team, Michael Woods is headed to UC Merced. 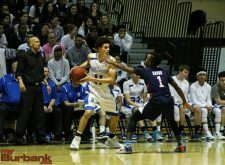 Thomas Clark is headed to Macalester College in St. Paul, Minn. Point guard Cameron Sweeten is going to play at Compton Community College. Faraz Khandaker plans to play, but has yet to make a decision. From the Burbank baseball team, Danny Porras is headed to Claremont McKenna. Matt Lungaro will attend the University of Massachusetts Dartmouth. Lungaro will have a teammate nearby, as Henry Leake is continuing his career at Babson College in Massachusetts. Girls’ soccer and track star Kira Bochard will compete in both sports at the University of Montevallo in Alabama. Her soccer teammate Dani Yanez is moving on to play at Chico State University. Track star Haleigh Cusumano will continue her career at UC San Diego. Boys’ track star Vedavit Shetty will move on to Glendale Community College. GCC will also get a boost from distance runner Angel Flores. Burbank girls’ distance runner Jamie Giammichele will move on to Cal State Northridge, where she will make an attempt to compete with the cross country team. From the girls’ volleyball team, Rachel Wiley will continue her career at Pierce College in Woodland Hills. The Indians’ class of 2017 is headlined by football players Chance Bell and Jesse Chamberlain. Bell, a running back, is headed to San Diego State. 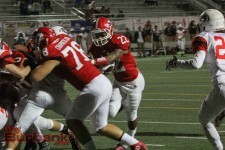 Chamberlain, an offensive lineman, signed a letter of intent with San Jose State University. Burroughs boys’ basketball star Tristen Hull will continue his career at St. Cloud State University in Minnesota. Diego Galaviz, a left-sided defender on Burroughs’ Pacific League champion boys’ soccer team, has signed with Cal State Dominguez Hill. Cameron Kelly and Jake Lasso-Spell are both planning on playing at Los Angeles Mission College. Goalkeeper Jordan Morgan is uncommitted, but will play in college. Defender Richard Alonzo is also considering the idea of continuing his career, but is undecided. From the girls’ soccer team, Mireya Gonzalez and Alondra Solis will both move on to Alcorn State University. 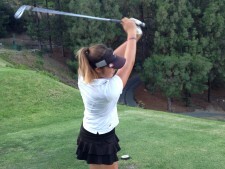 Golfer Maddie Riggs, who also played soccer, will bring her clubs to UC Irvine. Also from the girls’ golf team, Ashley Phelps will play at Cal State Northridge and Raelinn Arnold will play at Buena Vista University. Ashley Phelps will play golf at Cal State Northridge. From the boys’ golf team, Louis D’Aquila will play at College of the Canyons. Boys’ volleyball star Connor Ludlum is planning on playing at Santa Barbara Community College. Distance runners Patrick and Timothy Wells will continue their cross country and track careers at Pepperdine University. Middle distance star Daniel Fendrich is still undecided between Glendale Community College and Cal State Northridge. Distance runner Heidi Eligio will continue at Northridge. Izzy Funes, a jumper and sprinter, will continue her career at Occidental College. 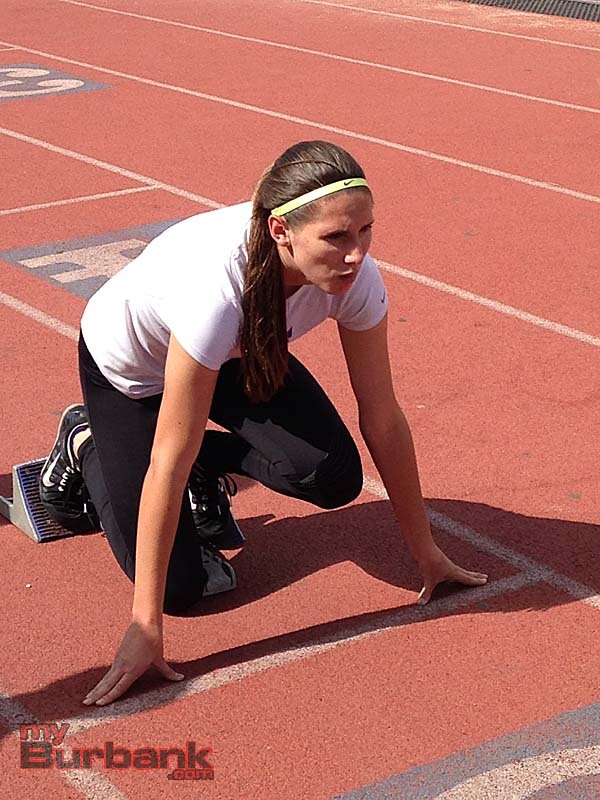 Sprinter Megan Wade will continue at the University of La Verne. Burroughs’ softball team will continue have a few more players moving on. Lauren Lopez will continue at Wilmington College in Delaware next year. Brianna Johnson will be playing at Bloomfield College in New Jersey and Amanda Flores will be at Pasadena City College. From the girls’ basketball team Haley Wilson and Caitlyn Pentland are expected to play at Glendale Community College. Burroughs baseball players Justin Palafox and Riley Hooper are also expected to play at Glendale Community College. Burroughs swimmer Nathan Armstrong will continue his career at Beloit College in Wisconsin. This entry was posted in Baseball, Boys Basketball, Boys Soccer, Boys Volleyball, Cross Country, Football, Girls Basketball, Girls Soccer, Girls Volleyball, Golf, Soccer, Softball, Sports, Sports Spotlight, Track, Volleyball and tagged Alondra Solis, Angel Flores, Ashley Phelps, Brianna Johnson, Burbank High, Burroughs High, Caitlyn Pentland, Cameron Kelly, Cameron Sweeten, Chance Bell, connor ludlum, Dani Yanez, Daniel Fendrich, Danny Porras, Diego Galaviz, Faraz Khandaker, Forrest Fajardo, Guy Gibbs, Haleigh Cusumano, Haley Wilson, Heidi Eligio, Henry Leake, Izzy Funes, Jake Kelley, Jake Lasso-Spell, Jamie Giammichele, Jesse chamberlain, Joey Miller, Jordan Morgan, Justin Palafox, Kira Bochard, Lauren Lopez, Louis D'Aquila, Maddie Riggs, Matt Lungaro, Matthew Villagran, Megan Wade, Michael Woods, Mireya Gonzalez, Nathan Armstrong, Patrick Wells, Rachel Wiley, Raelinn Arnold, Richard Alonzo, Riley Hooper, Scott Breslin, Thomas Clark, timothy wells, Tristen Hull, Vedavit Shetty on May 26, 2017 by Jim Riggio. 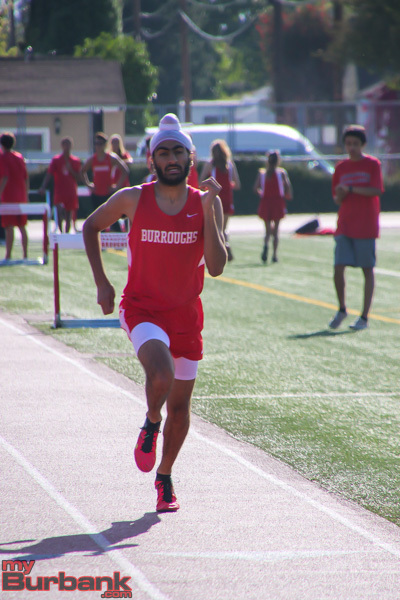 With stars Alexander Hirsch and Emily Virtue taking the day off, Jagdeep Chahal took over as the leader of Burroughs High’s talented distance running group. 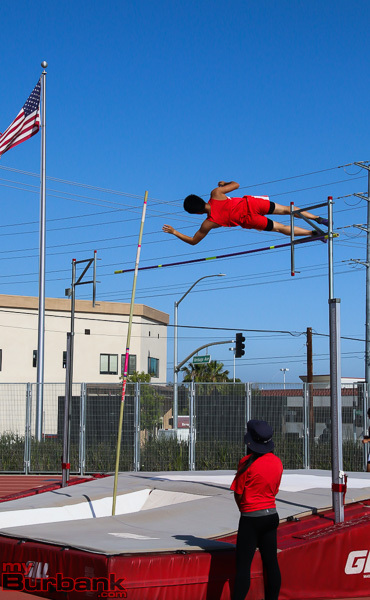 The junior set a personal best in one event and ran a fine time in another as the Indians defeated visiting Glendale High 104-32 in the boys’ varsity competition. Glendale surprisingly won the girls competition, 69-51. “For today, I wasn’t really concerned about the 1,600,” Chahal said. “I really wanted to PR (personal record) in the 800 because coach doesn’t put me in the 800 too often. (In the 1,600) I tried maintaining a kick for the last 400. I usually try to kick in the last 200. Chahal won the 1,600 in 4 minutes, 29 seconds. He took the 800 in a lifetime best of 1:58.99. 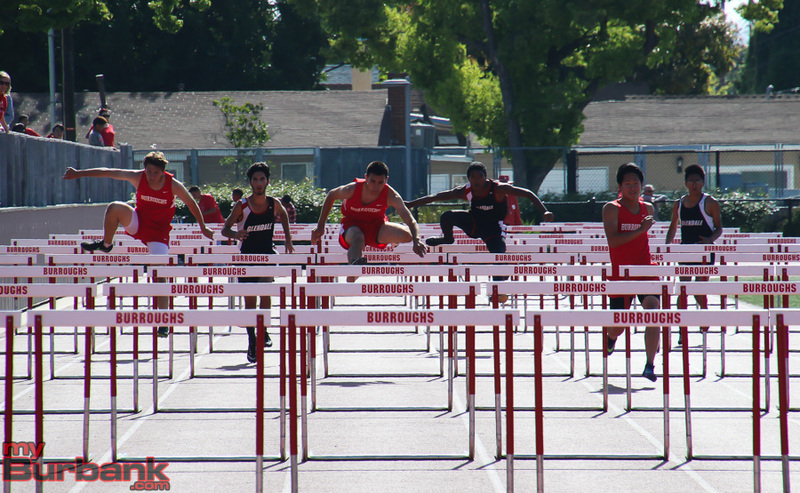 In the boys’ competition, Burroughs also got a victory from Daniel Han in the 110 high hurdles (16.0). 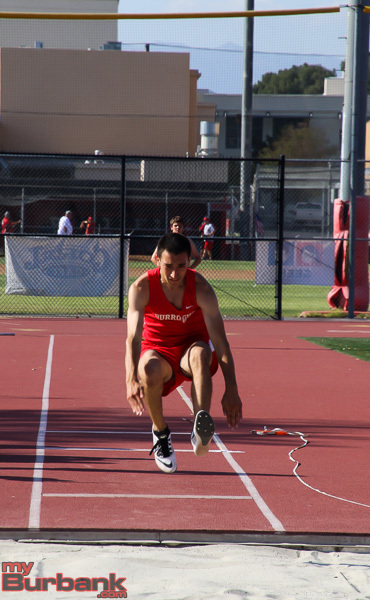 Max Carrillo won the 300 hurdles (42.37) and the triple jump (39 feet, 1 inch). Christian Valles won the pole vault at 14-0 and took the long jump (19-3). Sammy Duran won the 200 in an impressive 22.62. Daniel Fendrich took the the 3,200 (10:25). Azeal Estrada won the high jump (5-6). Mike Dermendjian won the discus (116-9). Burroughs also won the 400 (45.12) and 1,600 meter relays (3:40.25). 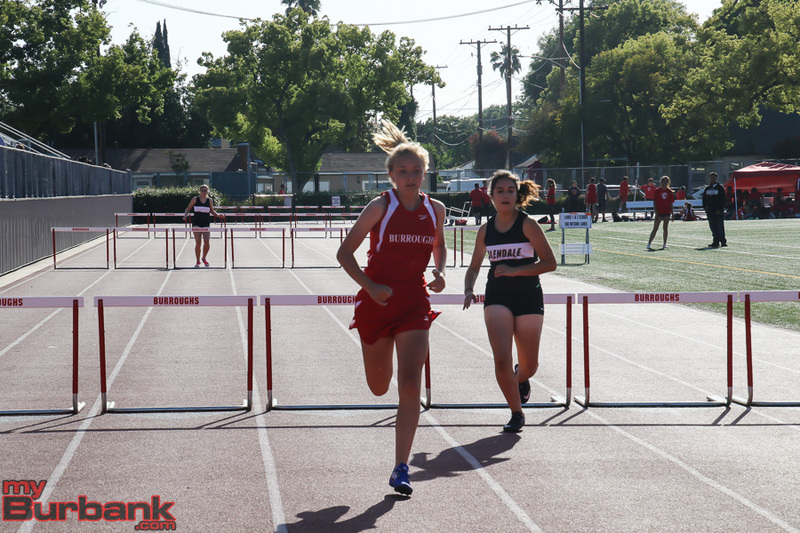 In the girls’ competition Burroughs got a victory from Heidi Eligio in the 1,600 (5:36) and the 800 (2:31). Emma Bartram won the 200 (27.06) and Vanessa Reveles the 3,200 (13:14). Elizabeth Switzer won the pole vault (9-0) and Nadime Younan the discus (95-0). 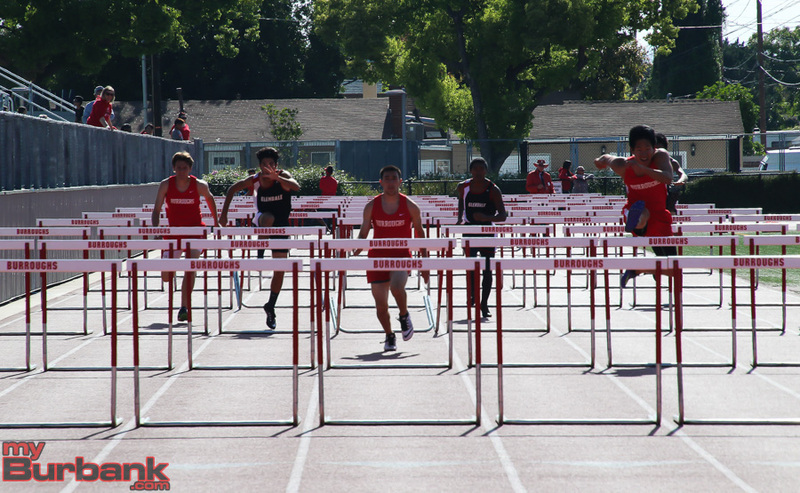 Burroughs will host Burbank High next week in its final regular season dual meet of the season. This entry was posted in Sports, Track and tagged Burroughs track and field, Christian Valles, Elizabeth Switzer, Heidi Eligio, Jagdeep Chahal, Max Carrillo on April 13, 2017 by Jim Riggio. The Burroughs High boys’ cross country may be one of the best teams in the CIF Southern Section. But the Indians know they have to be their best in league meets because the Pacific League competition is tough. Burroughs won the boys completion in the first league meet Wednesday at Crescenta Valley Park followed by Arcadia and Crescenta Valley. 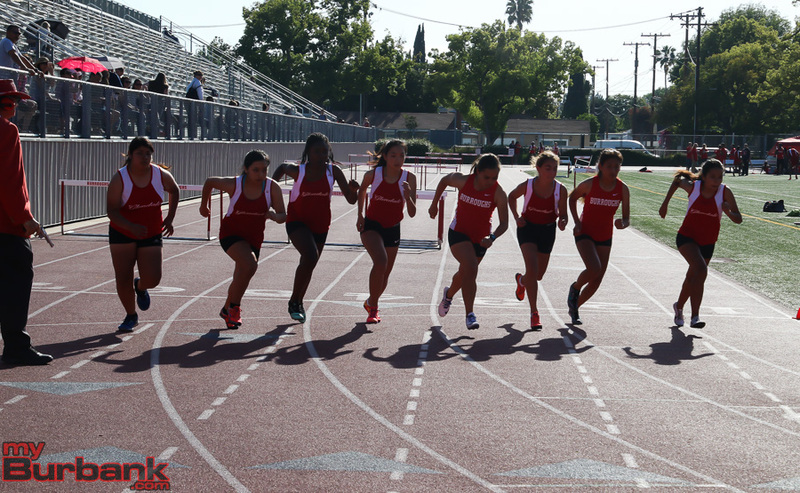 Burbank High finished second in the girls team competition, trailing just Arcadia. 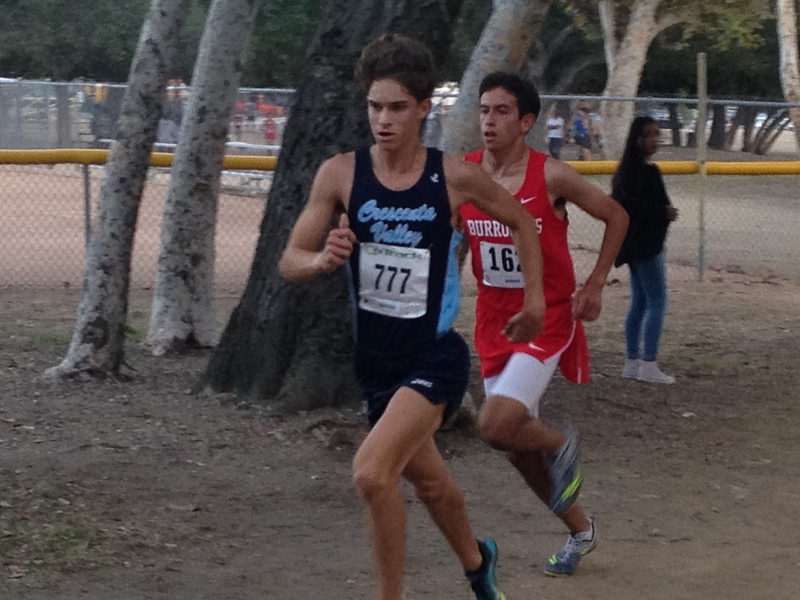 Crescenta Valley High junior Colin Fitzgerald won the boys’ varsity race, covering the 3-mile course in 15 minutes, 32 seconds. 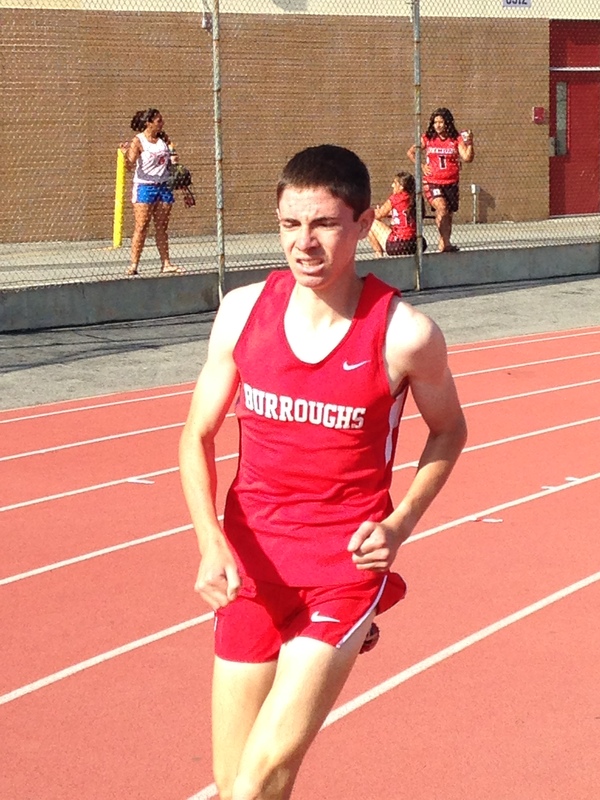 Burroughs junior Alexander Hirsch, who was running in his first meet of the season, took second in 15:43. While Arcadia finished closest to Burroughs in the standings, it was Crescenta Valley that opened some eyes as the Falcons appear to have created a great showdown with Burroughs for the next couple of years. 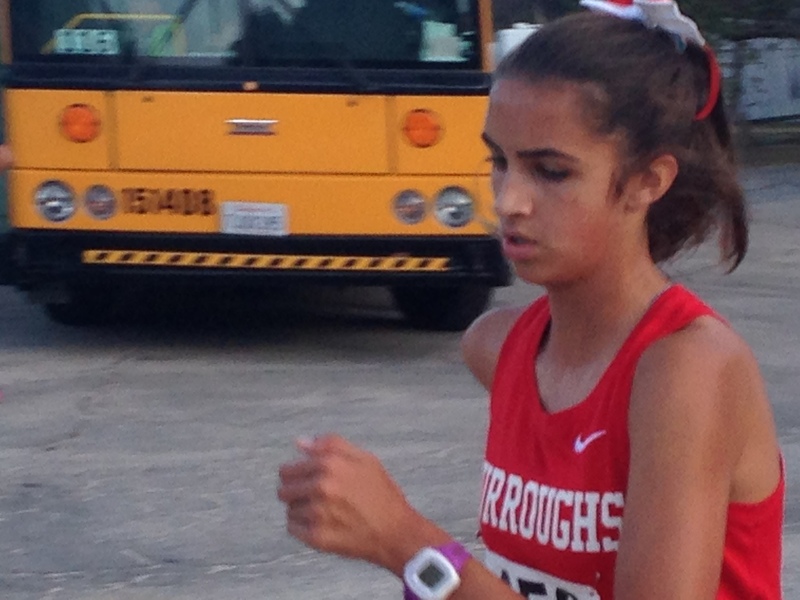 Burroughs, which had four underclassmen in its top seven, saw all seven of its runners finish under 17 minutes. CV, which has no seniors in its top seven, also had all seven under 17 minutes. Junior Jagdeep Chaahal (fourth, 15:50), senior Timothy Wells (fifth, 15:58), junior Jacob Calderon (eighth, 16:15), senior Daniel Fendrich (10th 16:18), junior Andrew Hoxsie (17th, 16:33) and senior Patrick Wells (22nd, 16:46) round out Burroughs top seven. Burbank, which finished fourth in the league standings, got some solid performances from seniors Angel Flores and Elijah Parrott. They finished 19th and 20th in 16:39 and 16:40, respectively. Burbank had four sophomore take the team’s third and through sixth spots with Jahir Olvera (27th, 17:48) leading the charge. He was followed Nick Glover (28th, 17:53), Peter Al-Hasani (30th, 18:28), Sergio Bernal (34th, 18:42) and senior Samir Malhotra (36th, 19:16). “We’re still training hard. Some of our varsity boys have run faster through two miles in route than they did in track,” Burbank coach Kathryn Nelson said. “We’re seeing a big improvement. This league is full of incredible teams. 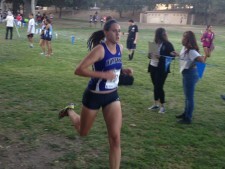 On the girls’ side Burroughs Emily Virtue won by over a minute, winning in 18:18. Arcadia then had a pack of six runners, which helped the Apaches easily win the team title. Burbank was led by senior Gabby Collins (eighth, 19:45). Freshman Sol Fernandez (11th, 20:39), sophomore Natalie Danao (13th, 20:46), senior Kira Bochard (14th, 20:47), senior Jamie Giammichele (18th, 21:13), freshman Jordan Delgado (26th, 22:13) and freshman Sofya Arakelyan (33rd, 23:40) round out the Bulldogs. “Our goal was to get second,” Nelson said. Senior Heidi Eligio (ninth, 20:02), junior Sapphire Sandoval (15th, 21:02), junior Kenna Guzman (22nd, 21:32), sophomore Lakely Nealis (25th, 21:53), junior Ana Villalpando (27th, 22:24) and junior Catrina Villalpando (31st, 22:57) round out the Indians. 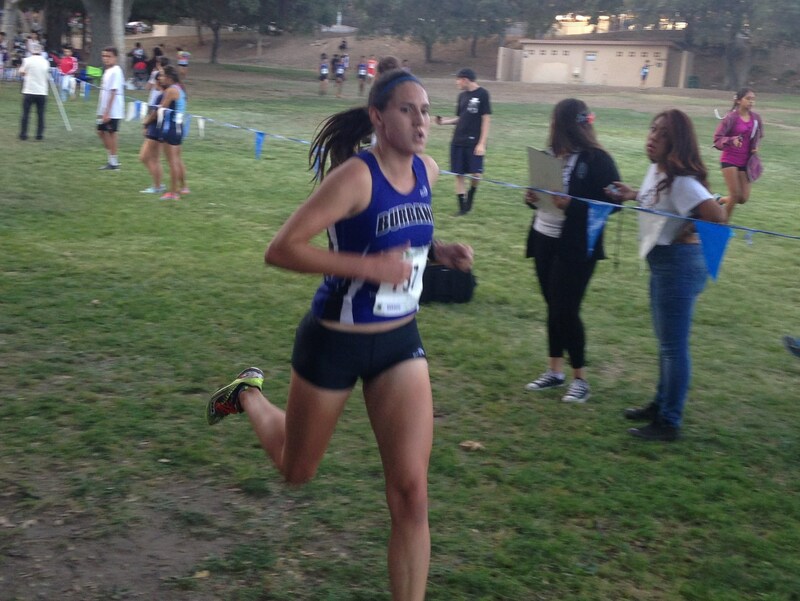 This entry was posted in Cross Country, Sports, Uncategorized and tagged Alexander Hirsch, Angel Flores, Burbank cross country, Burroughs cross country, Elijah Parrott, Emily Virtue, Gabby Collins, Heidi Eligio, Jagdeep Chahal, Jamie Giammichele, Kira Bochard, Natalie Danao, Sol Fernandez, timothy wells on September 23, 2016 by Jim Riggio. 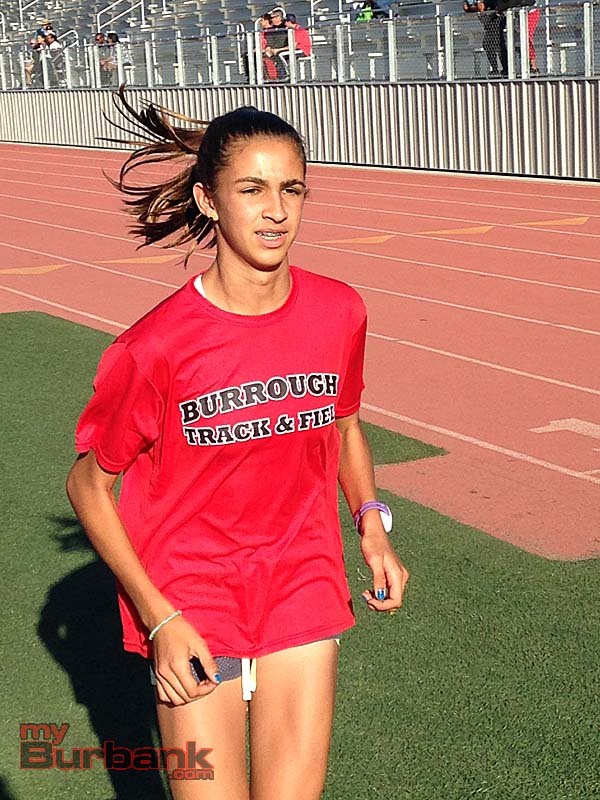 Success in long distance running is not something new to Burbank or Burroughs high. Burroughs, which won a CIF Southern Section boys’ Division I title in 2014, is a strong contender to return to the podium in 2016. Burroughs Emily Virtue looks to remain as one of the best in the nation. 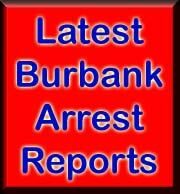 Burbank looks to have a strong girls’ team and has a young boys’ team. If the Indians stay healthy, they may be the team to beat in the CIF Southern Section. With a strong pack of four elite runners, Burroughs will be tough to top. Senior Timothy Wells and juniors Jacob Calderon, Jagdeep Chahal and Alexander Hirsch have all gone under 4 minutes, 30 seconds in the 1,600. Wells has also gone 9:28 in the 3,200. Calderon also has run 1:57.8 in the 800. Chahal has gone 9:39.15 in the 3,200 and Hirsch went 9:39.6 in track last spring. 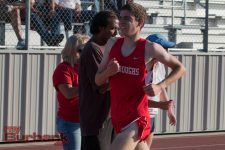 Senior Patrick Wells could be the leader of Burroughs’ next pack that makes up the fifth through seventh runners. He went 10:00.48 in the 3,200 last spring in track and field. Senior Daniel Fendrich (2:03.64 in 800), juniors Andrew Hoxsie (10:10.35 in 3,200) and Chris Hoxsie, figure to fill out the rest of the varsity. “Our goal is to have all of our kids running their best at the end of the season and, at that time, know who our top seven are,” coach John Peebles said. On the girls’ side, junior Emily Virtue will look to remain as one of the best in the nation. The defending Pacific League champion took second in the CIF championships and was sixth in the state. She finished eighth in the Foot Locker Western Regionals and 38th in the national championships at Balboa Park in San Diego. 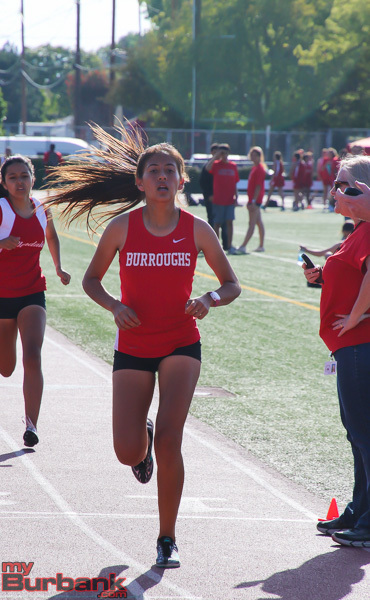 After Virtue, Burroughs has senior Heidi Eligio, who finished eighth in league finals last year. 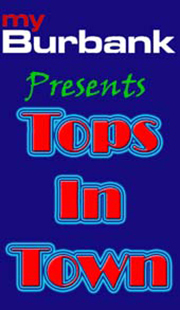 Junior Sapphire Sandoval, sophomore Lakely Nealis figure to hold down the next two spots. Rounding out the top seven are senior Dru Kim, junior Kenna Guzman and junior Catrina Villalpando. The Bulldogs are not as deep as in the past. But this is a program that has produced many elite runners dating back all the way to the 1960s. Burbank has co-coaches in Robert Hammell and Kathryn Nelson. Nelson is the wife of Bulldlegend Jeff Nelson, who is arguably the greatest American high school distance runner of all time. The Bulldogs have a stronger girls’ team this season, even though they lost star Candela Fernandez to graduation. 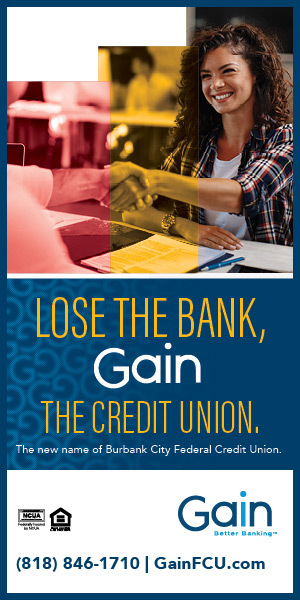 Burbank is led by a group of seniors. Gabby Collins and Jamie Giammichele both had solid junior years. Collins ran 11:45 in the 3,200 last spring in track. 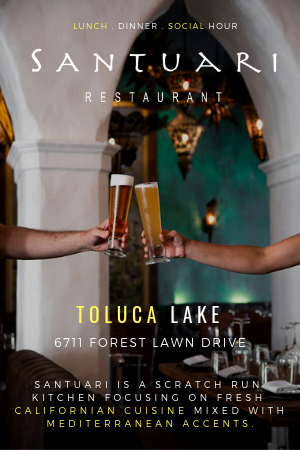 Giammichele ran 19:51 at Mt. Sac last season. Kira Bochard, who finished 10th last season in league finals, could also challenge for the top spot. Sophomore Natalie Danao, who ran 20:12 at league finals a year ago, figures to be in the top five. 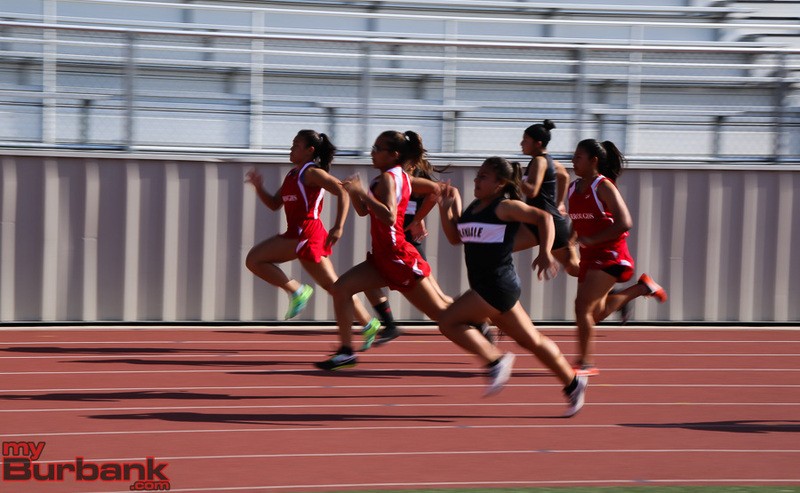 Junior Noemi Apreza (12:59 in 3,200 in track) will probably hold down the fifth spot. Freshmen Sol Fernandez and Sofya Arakelyan have been impressive in practice and could be future stars. Burbank’s boys’ team is led by senior co-captains Angel Flores and Elijah Parrott. Flores ran 10:09 in the 3,200 in track and Parrott ran 16:39 at Mt. Sac last season. Sophomore Jahir Olvera is coming off a solid season in track in which he ran 10:37 in the 3,200. Sophomores Nick Glover, Sergio Bernal and Peter Al-Hasani are all moving up the varsity. Senior Samir Malhotra is another newcomer. “Both the girls’ and boys’ teams are very young this season with many new faces at the varsity level. We graduated three girls and six boys from last year’s varsity team. We will look to our underclassmen to gain valuable experience for future years,” Nelson said. 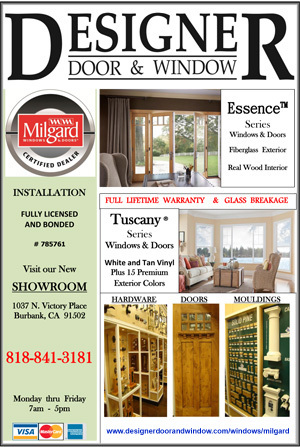 This entry was posted in Cross Country, Sports, Uncategorized and tagged Alexander Hirsch, Angel Flores, Burbank High cross country, Burroughs High cross country, Elijah Parrott, Emily Virtue, Gabby Collins, Heidi Eligio, Jacob calderon, Jamie Giammichele, Japdeep Chahal, Kira Bochard on August 31, 2016 by Jim Riggio.